Jen Bervin, River, 2018. Silver foil-stamped cloth sequins, metallic silver thread, silver mulberry paper, mull, Tyvek. The Des Moines Art Center is pleased to premiere River by artist and poet, Jen Bervin, as part of the exhibition Iowa Artists 2018: Jen Bervin. River maps the Mississippi from the headwaters in Lake Itasca, Minnesota to its delta south of New Orleans, Louisiana. 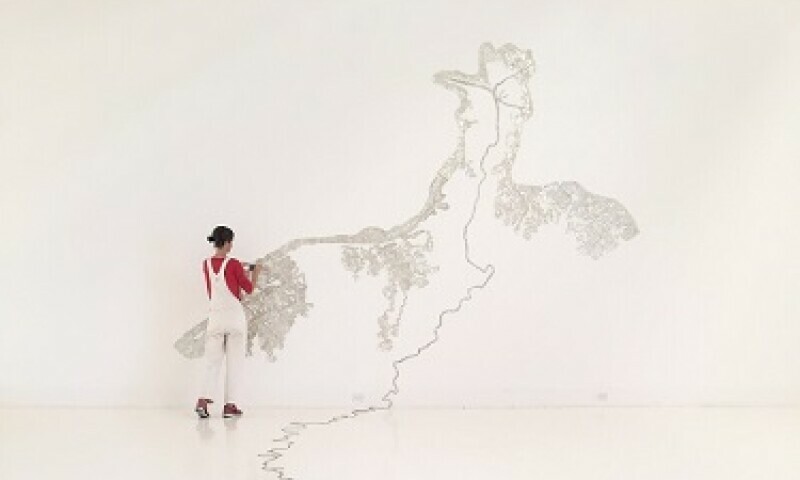 Over the course of 12 years, the artist sewed the 230 curvilinear feet long sculpture by hand, including each of the thousands of reflective, silver sequins that densely cover the surface. She calculates that it took the same amount of time to sew each section of the river that it would take to walk the real one—the scale of the “map” is one inch to one mile. River is presented on the ceiling of the I. M. Pei building from a geocentric perspective, that is, as if viewers were inside the earth’s interior looking up at the river bed. Jen Bervin was born and raised in Dubuque, Iowa and currently resides in Connecticut. Her poetic, multidisciplinary, conceptually-driven work results from intensive research and collaboration with artists and specialists ranging from material scientists to literary scholars.